// protocol (that last argument - 0). * bind - bind a name to a socket. // want to associate an address with. // Address varies depending on the address family. // a `struct` that suits our protocol. // Size of the address structure pointed to by addr. btw, its size if `N`". oh, thx! 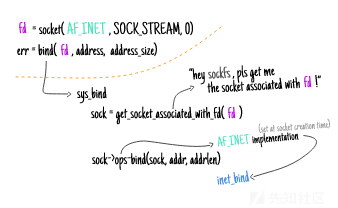 I'll let `af_inet` know about it! >> forwards it to the af_inet implementation of `bind`. 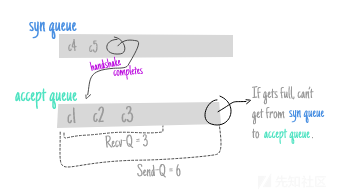 * @listen_fd: the socket to bind to an address. // The family that the address belongs to. // AF_INET: ipv4 "internet" addresses. // bind the socket to (in network byte order). // (padding it for reasons I don't know). 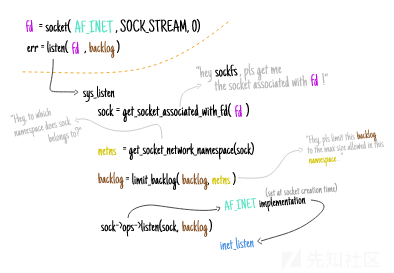 # type - SOCK_STREAM or SOCK_DATAGRAM). // Copy the address to kernel space. * that we end up creating through `sockfs`. // this point, we're clearly not in the `SS_FREE` state. // the file descriptor (userspace). * AF_INET specialized representation of network sockets.sockets. // by the user from `userspace`). // specific representation of a socket (`struct socket`). // specified in its struct. // struct supplied from userspace. // bind to a privileged port. // of if it's already bound. // one that we've supplied. //     if you don't specify one. (snum || !inet->bind_address_no_port) && // has a port set? // specified in the address supplied. // "listen for connections on a socket." // Run the security hook associated with `listen`. // before at `socket(2)` time. /bin/sh -c "echo 1024 > /proc/sys/net/core/somaxconn"
*-> Local address in the format    *-. // without a protocol specified. # as much info as possible. --tcp \      |        to be accepted. --listen \   |    .-> Maximum size of the backlog. // the idea of a connection wouldn't make sense). // that is going to be able to receive connections. // was capped by the kernel. // that it's not started yet. // Marks the socket as in the TCP_LISTEN state. // bound to the socket or pick a "random" one. # not possible at the moment).